As part of Fiat Chrysler’s recent Dog And Pony show for investors, the company’s Chief Technical Compliance Officer, Mark Chernoby, described FCA’s ambitious electrification plans, which include the rollout of mild hybrid, hybrid, plug-in hybrids, and pure electric vehicles across 30 nameplates. Here’s what that plan looks like. “Proven competency in developing EV technology,” Chernoby’s presentation reads in a statement of—if we’re honest—hyperbole. Fiat Chrysler has, for the longest time, lagged behind much of the industry in EV and hybrid technology, only recently offering the Pacifica PHEV, Ram 1500 mild hybrid and Jeep Wrangler mild hybrid, while begrudgingly selling the 500e electric vehicle to meet California regulations. But now the company is ready to dial up its efforts, announcing a nine billion Euro (approximately $10.5 billion) investment between 2018 and 2022 to “introduce a range of electrification solutions.” Those solutions, Chernoby shows in the presentation, will come in the form of four “EV Systems”: mild hybrid, hybrid, plug-in hybrid and battery electric vehicle. Those EV systems can be described as P1, P2, P3 and P4. 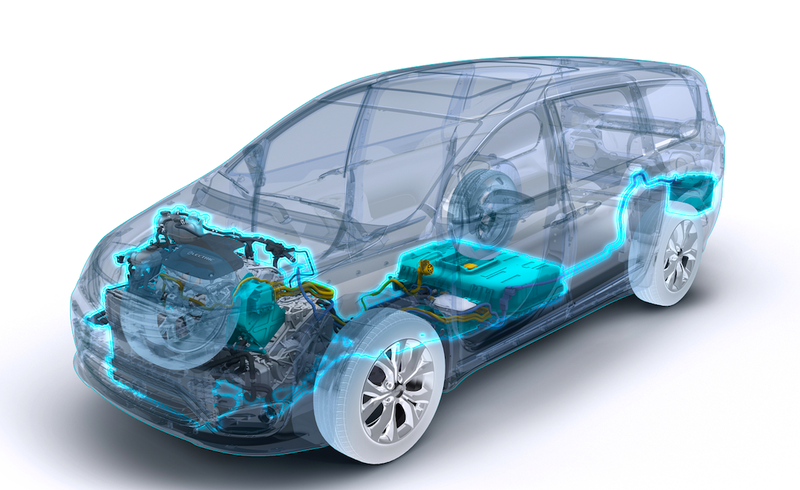 As mentioned in our 48 volt hybrid explainer article, the “P” designations refer to the method in which the electric motor is integrated into the powertrain. The slide above shows P1F on the engine’s accessory drive. That system, also called “P0,” represents a Motor Generator Unit or Belt Starter Generator, like those found on the 2019 Ram 1500 and the 2018 Jeep Wrangler JL. These devices—which offer boost, engine stop/start, brake regeneration and 12-volt accessory power generation—are easy to package, taking the place of the alternator, but their torque input is limited since they send power through a serpentine belt. P1F is also unable to move the vehicle without having to turn the engine over (this adds drag). The P1 system is similar, except it’s got higher torque capacity, since the motor is crankshaft mounted. P2 is an electric engine that sends power directly into the transmission, allowing it to propel the car without having to deal with the friction and pumping losses associated with cranking the internal combustion engine. P3 is a motor at the transmission output, and finally, there’s P4, in which the electric motor sends power directly to the drive axle. P3 and P4 offer maximum energy recuperation potential during coasting. Fiat Chrysler plans to spread those various types of electrification across its lineup, with 30 nameplates to receive one or more of the EV systems mentioned by 2022. There will apparently be a new 500e city car Battery Electric Vehicle in 2020, and the Grand Commander, Maserati Alfieri and Maserati Quattroporte will also receive fully electric powerplants. The slide also shows the Grand Cherokee coming as a Hybrid Electric Vehicle (a non-plug-in in which the wheels can be driven by the gas engine or electric motors) with electric motors driving the engine and transmission (P1P2), as well as plug-in hybrid tech coming to the Wrangler, Renegade and the new Maserati Alfieri, which also combine the functions of multiple electrified architectures (the Pacifica, for example, has two motors integrated into its transmission, and is considered a P2P3). All of this electrification is driven by global automotive regulations, which Chernoby breaks down in his presentation. First, he talks about Europe, calling it the “most challenging regulatory/consumer environment,” citing a major shift in regulations starting in 2020 (referring to the 25 percent drop to 95 grams of CO2 per kilometer), zero emissions zones being implemented in cities, major CO2 fines and a departure from diesel. He then discusses China, and its strong drive towards electrification. That drive includes mandates for New Energy Vehicles, which are defined as battery electric vehicles, plug-in hybrids or fuel-cell vehicles. Automakers must score 10 percent in 2019 and 12 percent starting in 2020, with the scores being tied to production of the aforementioned fuel technologies. In addition, the presentation mentions a transition in China to a requirement five liters per 100 kilometers by 2021, followed by a transition to four liters per 100 km by 2025. Next, Chernoby mentions the U.S., and regulations coming from NHTSA, the EPA and the California Air Resources Board, which he says require about a four-to-five percent CO2 reduction annually, though the regulations are currently in a state of uncertainty. The final market in the presentation is Latin America, with the presentation mentioning an INOVAR target of 133 grams of CO2 per 100 kilometers, and heavy use of ethanol fuel affecting the country’s powertrain outlook. Dodge Pulls Plug On Circuit EV Electric Sports Car?